Information, pics, and videos of Bail Hotline sponsored charity and community events. When Arnold talked about not having anything and not knowing anyone but yet strangers at his gym gave him Christmas presents! That was awesome. Because of something some of us may see as so simple, it can be life changing for one person and for Arnold it was. 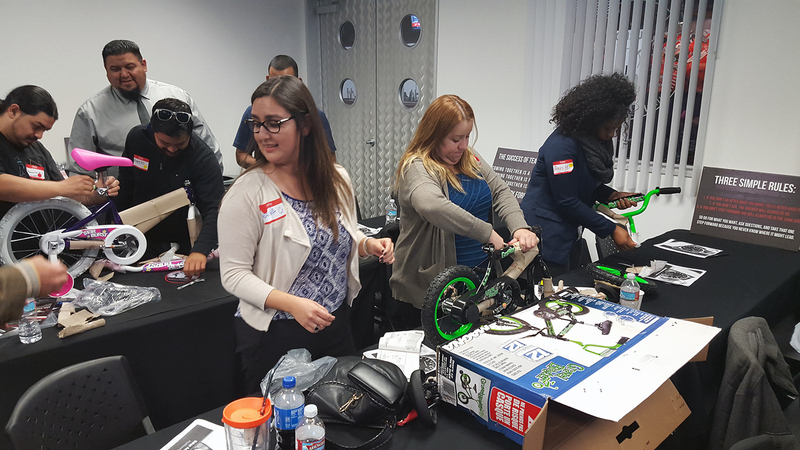 Bail Agents from the Bail Hotline built two-dozen red flyer wagons during their sales training sessions to promote teamwork and motivation to finish 2013 with a bang. The wagons will be donated to local charities in the cities where many of their California offices are located. Every year around November, Bail Agents from the Bail Hotline Bail Bonds meet to refine their skills, build teamwork, and motivate themselves to finish the fiscal year on a strong note. It all culminates in what Bail Hotline describes as their yearend BLITZ! Get “liking” to show your “love,” California. In honor of Breast Cancer Awareness Month Bail Hotline Bail Bonds is encouraging the public to show its support with a Facebook effort to support The Pink Ribbon Place, a program of Inland Agency. From Monday, October 1st through Wednesday, October 31st, Bail Hotline will donate $1 for each new “like” it receives on the company Facebook page (http://www.facebook.com/BailHotlineCA). The funds donated with help the Pink Ribbon Place program help combat cancer with programs that educate women age 49 and younger living in Riverside and San Bernardino counties about prevention and early detection. The Pink Ribbon Place also offers support to women going through breast cancer and their families by providing support groups, counseling, meditation groups, children’s program and health and wellness workshops. The Pink Ribbon Place mission is to promote healthy behaviors through education, to provide support to all women going through breast cancer and to expand access to diagnostic services for breast cancer. To “like” Bail Hotline Bail Bonds on Facebook, visit http://www.facebook.com/BailHotlineCA. Bail Hotline Bail Bonds is showing its appreciation and support for the military this Father’s Day by connecting military families: Bail Hotline is donating $1,500 (equaling 150 calling cards, $10 each) in international calling cards to For The Troops, a Southern California non-profit, who will send the cards to troops overseas. On Father’s Day, June 17th, service-members based overseas will receive the calling cards to call home to their families in the U.S.
With more than 290,000 troops serving overseas, the price of calling home is costly for many servicemen and women, with the average roaming fees from Afghanistan being as much as $3.99 per minute. For The Troops’ mission is to send care packages to the front line troops in Afghanistan and Iraq. These packages contain such things as snack items, DVDs, CDs, batteries, personal care items and magazines, etc. Bail Hotline Bail Bonds works with local and national organizations to provide support and assistance on a monthly basis. For more information on For The Troops, visit www.forthetroops.org. San Diego Home Cooking and Bail Hotline Bail Bonds are looking for San Diego’s “Best Moms,” this Mother’s Day. The two local, family-owned companies are encouraging guests to come into SD Home Cooking and nominate their moms during the month of April for a complimentary Mother’s Day meal and spa day. Guests can fill out a nomination form at any of the five San Diego Home Cooking locations during the month of April. At the end of the month 10 moms will be chosen for a complimentary meal in celebration of Mother’s Day. San Diego Home Cooking is accepting nominations at all five locations: Mission Valley, Lakeside, Lake Murray Café, Centre City Café (Escondido) and Café 56 (Carmel Valley). For more information, visit www.sandiegohomecooking.com or call (858) 484-5789. San Diego Home Cooking offers traditional American comfort food and homemade Hungarian dishes. Each Café makes fresh daily dinner rolls, biscuits, secret recipe homemade dressings, hearty soups, gravies, house-ground hamburger patties, oven-roasted turkey breast and a large selection of “mama’s” homemade pies. San Diego Home Cooking opened as the Center City Cafe in Escondido in 1997. Since then, owner Mel Makaric has opened four additional San Diego locations including Cafe 56, Lake Murray Café, Mission Valley Café and Lakeside Cafe. All five San Diego Home Cooking restaurants are open for breakfast, lunch and dinner with a variety of choices spanning an extensive menu and offer affordable prices in a family-friendly setting. For more information, visit www.SanDiegoHomeCooking.com. Bail Hotline Bail Bonds teamed up with local, family-owned restaurant group, San Diego Home Cooking, to search for San Diego’s “Best Moms” this Mother’s Day. Guests submitted nominations at all five of the San Diego Home Cooking restaurants during the month of April and 10 winners have now been chosen! Ten mothers were chosen based off the written description answering, “What makes your mom the best and why does she deserve a special day of pampering?” Winners were given a complimentary brunch at San Diego Home Cooking and a spa day at a local salon and spa, donated by Bail Hotline. Congratulations moms, you deserve it! On Saturday April 28th, Bail Hotline showed their love and support for the March of Dimes by walking 6 miles around downtown Riverside to help raise money in the fight to prevent birth defects and premature births. Many families and businesses from Riverside County participated in the March for Babies. The walk began at the local Riverside Community College. There were many different teams walking and one of which raised over 100 million dollars for the cause. Some of Bail Hotlines very own team included Lisa Fernandez, who initiated the participation in the event, Jennifer Velez and Darrin Ramirez. The walk took about 2 hours to complete and all of the Bail Hotline team crossed the finish line. Bail Hotline looks forward to working with the March of Dimes in the years to come. 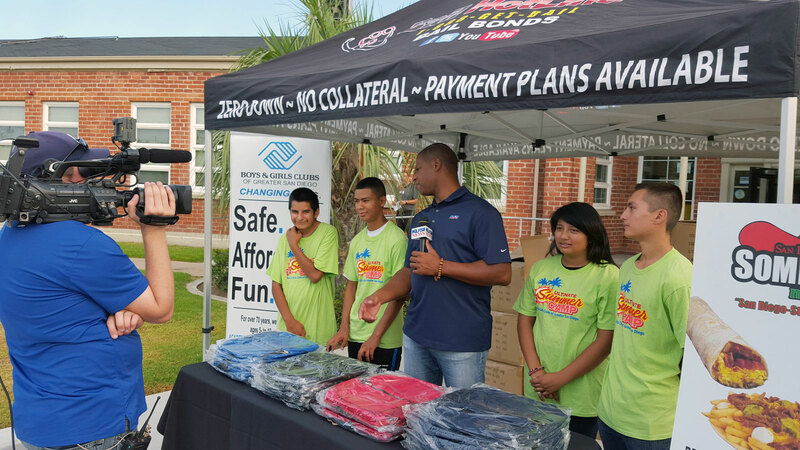 Bail Hotline Focuses on great events like these to give back to the community. 2012 Anaheim Dub Show held at the Angel Stadium of Anaheim on Sunday, March 25. People from all over the Inland Empire and Los Angeles Area came to view awesome cars. Bail Hotline a California bail bonds company, one of the supporters of the Anaheim Dub Show, had a booth giving out free gifts such as shirts and lanyards. Even though the dub show ended in 4 inches of rain, fans stayed as long as they could to enjoy the amazing 2012 Anaheim Dub Show. For the second year in a row, the Bail Hotline Bail Bonds is hosting a St. Patty’s Day party with a catered lunch for 150 San Diego veterans at the Veterans Village of San Diego (VVSD). With decorations and volunteers to serve food, we’re excited to celebrate those who served for a holiday lunch! A few of our Bail Agents took some time out of the afternoon to help with the event. Check back for a video as a local news station came by for an interview!